Garden walls are a fantastic way to add a visual impact to any landscaped garden. Create separate levels for a visual impact, usability or functionality. 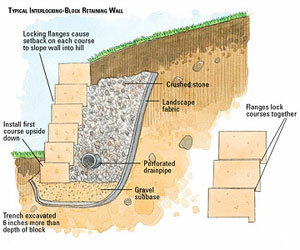 Retaining Walls Canberra is a local retaining wall business, servicing the ACT in all areas of supply and construction of retaining walls for the passed decade. Our clients are local, national and international with property interests in Canberra. Our Prices are visible on our website, pay easily online with pay pal. Excavation Canberra – Preparation work for landscaping. Bobcat and Excavator hire.